If you’ve ever printed anything from a computer, you’ve inevitably wound up trying to print something that you soon discovered wasn’t needed. Regardless, rather than letting the print job continue and waste ink and paper, the best thing to do is cancel the printers print job or jobs. There are a few ways to cancel printing in Mac OS X, we’ll show you the easiest using a simple printer tool that’s bundled onto all Macs. 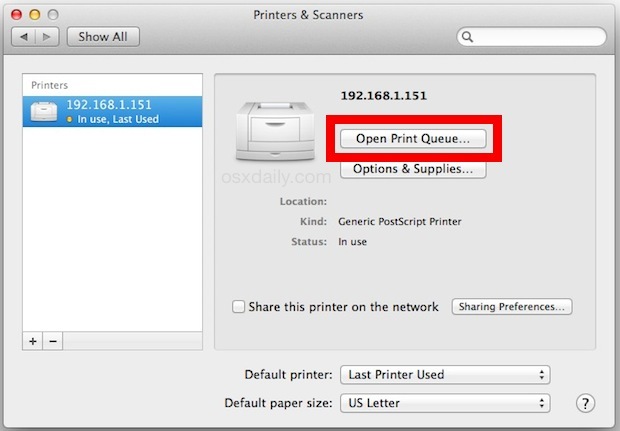 Accessing the printer management utility and all print queued items in OS X can be done in two ways, and this print tool shows all printing jobs that are in the queue and lets you manually interact with them to cancel and postpone print jobs for any and all printers associated with the Mac. Once you’re in the printer utility, select the print job(s) that you want to remove from the queue and click the (X) buttons alongside their name to delete them from the print job, this cancels that job and clears out the queue. You can also select a printing queue item and hit Command+Delete to remove it, or remove it from the Jobs menu. It doesn’t matter which method you use to access the print queue on the Mac, canceling, holding, resuming, or removing anything is the same. This applies to all versions of OS X as well, whether Mavericks as shown here or OS X Yosemite, or any other version on the Mac. In some rare situations, the printer queue will refuse to behave and either won’t accept input, or won’t even load. 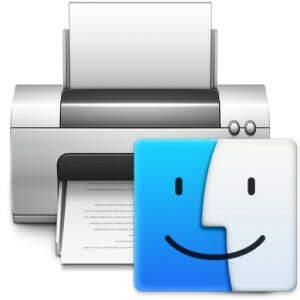 If you’re in some really dire printing situation, you can always go full force to reset the entire printer management system in Mac OS X, which almost always resolves the problem, though it will require setting up the printer again. If for some reason you need to review your printing history, the cups function works to quickly show that information through a web browser (yes, seriously a web browser will review your printing history!). By the way, depending on your needs and the work environment, often just simply printing to a PDF file is sufficient, which can be emailed and accessed universally by just about every conceivable device in the world. And it sure beats the archaic method of using some problem-prone machine to stain ink onto sheets of heavily modified compressed dead wood fibers, but sometimes printing physical paper is necessary after all. Thanks, keep up the good work? If your printer is nearby it may be easier to just hit the cancel button on it and let the print job be spooled and dumped by it. Is it possible automatically delete a file when printing is done? Thanks- having a bad day with the printer until I spotted “show everyone’s jobs” in your article…. the printer was following someone else’s login, and churning out a large document repeatedly, but hiding it from me…now deleted, Thanks!